During university, my friends and I would always make collaborative meals. These were similar to potlucks, but instead of bringing a different dish, everyone brought a different ingredient. Everyone prepped and cooked and the end result was a delicious meal. We’d make stir-fries, pasta, and my all-time favourite, fresh spring rolls. 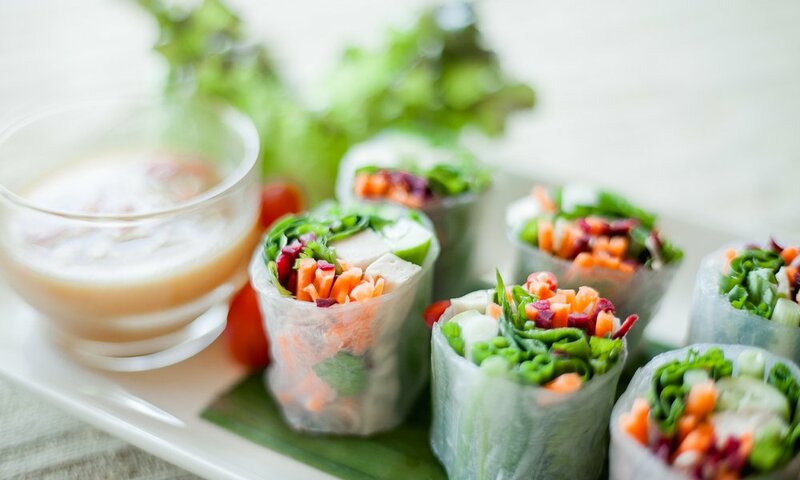 Fresh spring rolls, otherwise known as Vietnamese spring rolls, are a mix of fresh veggies, tofu, shrimp, and rice noodles – all wrapped in individual rice paper wraps. Every Wednesday night, someone would bring cucumbers or carrots, someone else rice noodles, another one tofu or shrimp, and my roommates and I would supply the sauce fixings and rice paper wraps. We’d chop, slice, and sauté, and before you know it, a delicious dinner would be ready in under 30 minutes. Get the whole family involved for a nutritious meal in no time! These ratios are for about 8-10 rolls, depending on how much you add to each roll. Optional: other fresh produce like red pepper, butter lettuce, grated beets, bean sprouts, green onion, cilantro, or mango. Optional: chili sauce to spice it up. Prep your fresh produce. Start finely slicing the carrots and cucumber, and chopping your basil into bite-sized pieces. If many people are making this dinner with you, start assigning tasks: someone on produce, someone on the sauce, and someone else on protein. Once your fresh ingredients are ready, start making the sauce. Mix peanut butter, soy sauce (or tamari), lime juice, and sweetener together. Then slowly mix in water until you reach your desired consistency. Taste and adjust ingredients accordingly: add lime juice to make it more sour, sweetener to sweeten it, salt to enhance flavour, etc. Prep your protein. If you’re making shrimp, follow the instructions on the package. For the tofu, chop into strips lengthwise. Saute with a bit of oil and salt and pepper on medium-high for about 5-10 minutes, or until golden-brown and crispy. Lastly, cook your noodles. These don’t take long at all, typically about two minutes. Start by bringing a pot of water to a boil, and then follow instructions on the package. Once all ingredients are ready, add them each into separate bowls. Shrimp in one, tofu in another, and separate the fresh produce too. Then prep your rice paper wraps. Follow instructions on the package, but you may need to lightly wet these with warm water to loosen them up. Place a rice paper wrap on your plate, then assemble your ingredients! I start with the noodles, then produce, and lastly the protein. Add a drizzle of soy sauce if you like, then roll them up. Serve with peanut sauce, limes, and chili sauce as an appy or a light main. Enjoy! Find all your local and organic fresh spring roll ingredients at your nearest Blush Lane!